Home > Our Blogs > Facing Today > Journey to America: What's Your Story? Every family in the United States originated from somewhere else. 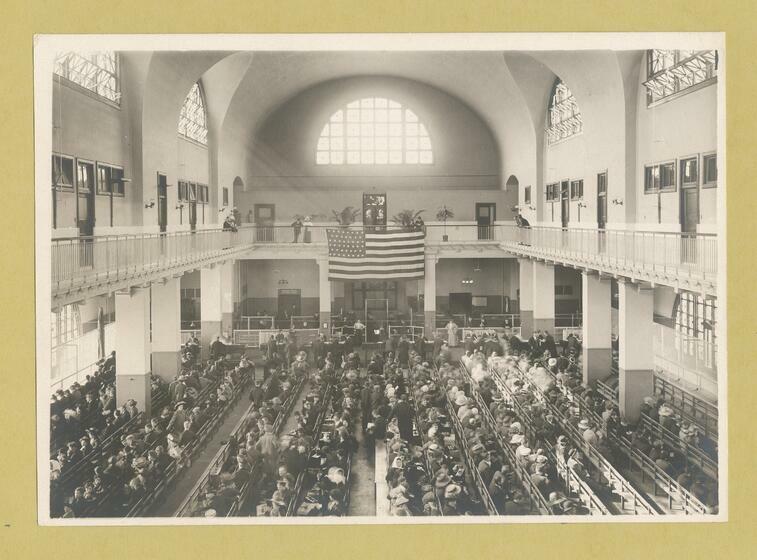 From Native Americans who migrated across a land bridge to North America to immigrants who sailed aboard a steamship to Ellis Island, many chose to come to America. Hundreds of thousands of others were brought here against their will aboard slave ships. Throughout this history, we have debated who should be allowed to come to live here and who may not. Laws and policies regarding immigration and refugee resettlement are important to debate in any country but just as important is the language and rhetoric we use in these debates. Too often, today’s rhetoric reflects a poor understanding of the history of immigration laws, creating distance between our own families’ narratives and the stories of those coming to America today. Reflecting on my own family history made me consider an important question: How might better understanding the historical context of our own ancestors’ immigration stories affect how we think about the immigration debate today? My ancestors emigrated from Alsace-Lorraine (a disputed territory between France and Germany) and Ireland within the second half of the 1800s. The reasons that likely motivated them are not much different than those of newcomers who are at the center of today’s debate. German and Irish Catholics were among the largest immigrant groups in the United States in the latter half of the 19th century. Irish immigrants fled famine, poverty, and lack of employment opportunity. Germans fled similar circumstances in addition to social and political unrest in the aftermath of wars. Today’s immigrants and refugees aren’t nameless, faceless hordes, but human beings seeking safety and prosperity just like my ancestors. Though I don’t know much about my ancestors’ specific circumstances,, there is one detail I’m certain of: they neither broke nor circumvented any immigration laws by entering the United States, because there were no such laws. It is not that German and Irish immigrants were universally welcomed to the United States; they were subject to plenty of anti-Irish and anti-Catholic sentiments. But there were no laws preventing them or anyone else from coming to the United States at the time. For me to claim that my 19th century ancestors were “legal” immigrants in contrast to today’s “illegal,” undocumented immigrants implies that my ancestors made a moral or ethical choice to “wait in line, follow the law, and play by the rules.” That claim puts distance between “us” and “them” by attempting to distinguish my “morally superior” ancestors from today’s “law-breaking” undocumented immigrants. The first significant immigration law was the 1882 Chinese Exclusion Act, which banned nearly all Chinese immigrants from entering the country. Laws further restricting immigration were enacted in the 1920s in response to the influx of Italians, Eastern Europeans, and Jews in the early 20th century. Soon they began enforcing strict quotas based on national origin, which lasted until 1965. New laws replaced these quotas with preferences based on family relationships, skills, and other factors. It is impossible for me to know what my ancestors would have chosen to do if faced with restrictions like these designed to keep them out of the United States. Was their desire for safety and opportunity, their longing to live in the United States, so great that they would have sought a way around laws in place to keep them out? Lucky for them, they didn’t have to choose. This is, perhaps, a question of “moral luck,” a topic we explore in the newly revised edition of Holocaust and Human Behavior. Our choices are often constrained by the ways we perceive the options available to us in any particular time, place, and circumstance. Can we praise someone in the past for being virtuously law-abiding when there were no laws conflicting with their goals and no dilemma requiring a moral choice? My goal is not to minimize the hardships and sacrifices our ancestors endured. To leave behind their home in search of safety, security, and opportunity was no easy endeavor. Whatever policies we decide to implement as a country or society today, we ought to strive to avoid the cruelty that often can result when we think of immigrants as threatening, criminal, or dangerous. Instead, by reflecting on our own stories about how we came to America, we might inject the debate with knowledge, insight, and humility that can help us steer clear of dangerous “us" vs. "them” thinking. This is what I learned from my story. What can you learn from yours? What can your students learn from theirs? Want to explore the idea of “moral luck” with your students? Check out the reading, “Moral Luck and Dilemmas of Judgment,” from our newly revised edition of Holocaust and Human Behavior.